UPDATED: Thu., July 13, 2017, 4:14 p.m.
DENVER – Paul Millsap was welcomed back to his old neighborhood with a reception that included a drum line and cheering children. It was a contrast to how the newest Denver Nuggets player left town years ago as a kid – his mom struggling to make ends meet. That wasn’t lost on the four-time All-Star forward as he was introduced at a recreation center Thursday after signing a three-year deal worth $90 million. He spent nearly a dozen years in a suburb of Denver before returning to Louisiana for high school and college. Searching for a fresh start, Millsap’s mother moved the family to Denver when he was just a toddler. But it was a struggle. His mom, Bettye, said she used to make $12 last for two days’ worth of meals for her four sons. In 1999, the Millsap family returned to Louisiana, where she had relatives to lend a hand. The 32-year-old Millsap gives the youthful Nuggets a proven veteran to pair with budding star Nikola Jokic. Millsap averaged a career-high 18.1 points last season with 7.7 rebounds and 3.7 assists. For landing the highly coveted free agent, give an assist to Denver Broncos linebacker Brandon Marshall. Marshall’s sales pitch helped sway Millsap’s decision. It definitely got Millsap’s attention. Denver (40-42) improved by seven games this year but still missed the playoffs for a fourth straight season. Millsap’s presence helps the Nuggets remain in the playoff conversation even in the ultra-competitive Western Conference. That’s partly because Millsap brings a defensive-minded mentality to the court. That and an unselfish style of play, which complements such young players as Jokic, Jamal Murray and Gary Harris. “We feel in Nikola and Paul, we have the most talented, most unselfish, best playmaking front-court in the NBA,” Malone said. 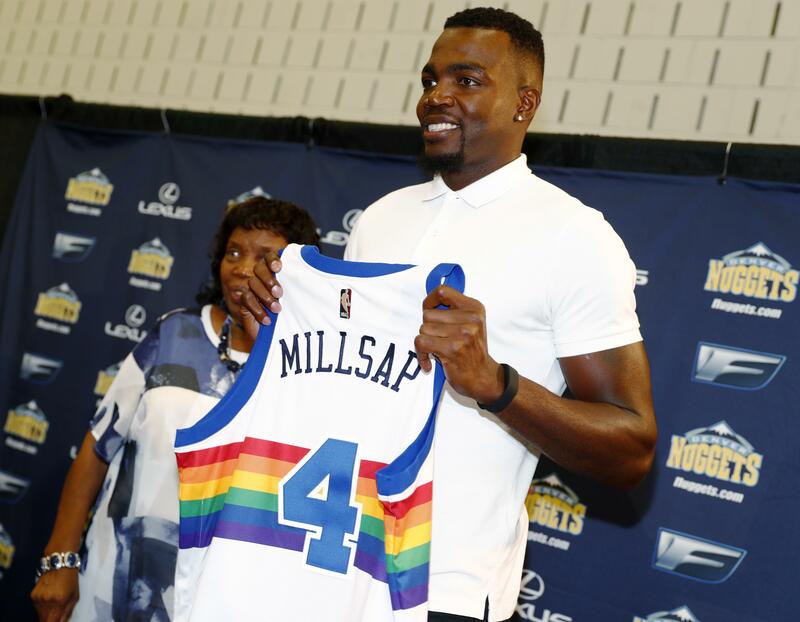 As a kid in Denver, Millsap developed into quite a quarterback and thought his future might lie on the field, not the court. He blossomed into a basketball player when he returned to Louisiana, where he became a standout at Louisiana Tech. Millsap was a second-round draft pick by Utah in 2006. He spent his first seven seasons with the Jazz, before signing with the Hawks in 2013. After years of striking out on landing big-name free agents, the Nuggets finally got one – with roots to the community, too. It means a lot to him to return to his old neighborhood, to his former city. Published: July 13, 2017, 11:04 a.m. Updated: July 13, 2017, 4:14 p.m.